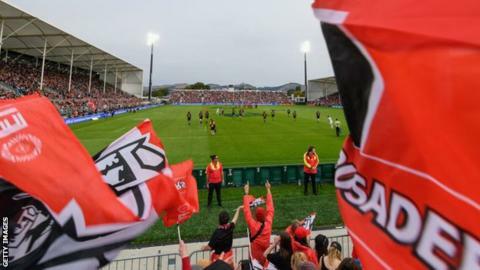 Chief executive Colin Mansbridge said the club name was "not a religious statement"
Super Rugby's Canterbury Crusaders say they are open to discussing a potential name change following the deadly mosque shootings in Christchurch. Since Friday's attacks, concerns have been raised over the team name's association with the medieval religious wars between Christians and Muslims. "We acknowledge and understand the concerns that have been raised," the New Zealand club said in a statement. It said the name is "certainly not a religious statement". "For us, the Crusaders name is a reflection of the crusading spirit of this community," the club added. "What we stand for is the opposite of what happened in Christchurch... our crusade is one for peace, unity, inclusiveness and community spirit. "This team and the wider organisation are united with our community in standing against such abhorrent acts... and in standing in support of our Muslim community." The club's chief executive Colin Mansbridge said they were open to initiating discussions about a change, in time. "The first thing for us is things are still fairly raw," Mansbridge told television network TVNZ on Sunday. "We're in a state of shock. We'll acknowledge the feedback we've had. It is appropriate." Australian Brenton Tarrant, 28, who police believe acted alone, has been charged with carrying out the shootings. The Crusaders, who have won a record nine Super Rugby titles, adopted their name 23 years ago when rugby went professional. All Blacks captain Kieran Read, who plays for the Crusaders and was caught up in the city centre lockdown at his daughters' school on Friday while police searched for the gunman, sent a message of support to New Zealand's Muslim community. "My heart goes out to the victims and their families, our Muslim community and the people of Christchurch," Read, 33, wrote on his Instagram account. "Our nation is experiencing a great loss of innocence in the face of all that happened. Bigotry and intolerance has no place here in Aotearoa [New Zealand]. This is not who we are. "Our strength lies in our diversity and while acts such as this are orchestrated in an attempt to divide us, love and unity will always prevail."